Heimtextil is an imperative event for Designers. It provides us with essential details on how to put together a collection for the upcoming season. As you must have read in my previous blog posts on Reconnect directions for 2011/2012, Sobriety, Mix Mash, Utility and Wilderness are the four trends that will command our attention throughout 2011. Colors always play a noteworthy role in defining trends. 2011 will see a whole lot of fantastic color schemes, all full of vigor and substance. All four trends showcase timeless colors in a new way, combined with deep-rooted culture, tradition, significance and need related aspects. Sobriety is going to be one of the most important trends to follow because it supports our desire for gravity of ideas, simplicity, sustenance of some classic products and emotions. It features herringbone patterns, knits, heavy woven fabrics, brush stroke prints in colors full with energy. With the focus on classicism, Sobriety takes an opposing stance to a fashion-focused, seasonal acceptance of trends, which were too often experienced to the disadvantage of sustainability. Mix Mash trend blends colors, patterns and manufacturing techniques from past eras in an electrifying way. It is a perfect reinterpretation of historic aesthetic values in an artistic way. This explains the use of contrasting textures, either coarse or handmade, printed crochet fabrics, embroidery and lace to depict ethnic influences. The idea is to create naïve style statements in bright orange, red, green, blue and purple. Utility envisages the making of utilitarian products. Key concepts are sailcloth, jute and recycling. It indicates us to use simple functional products and materials with high practical value. Wilderness is an extreme version of sustainability, showcasing handicrafts, natural colors and irregular structures. The point is to search for deep rootedness in our natural surroundings. In the last few days the blog posts covered the interpretations for trends for the upcoming year – 2011/2012. In addition to that, here are the color stories to go with those trends. Hope these will help you in defining colors for the design themes that you would design for the upcoming year. This is a technological era. We think in a modern hi-tech way and make every effort to be self reliant. We feel the need to attain a lifestyle of ultra maintenance by making maximum use of essential products. Wilderness, a Heimtextil Trend 2011/2012, takes us where we came from and gives us an opportunity to be at one with nature. The trend gives significance to crafts from the past like wicker-weaving. This renders a rather personalized look in every product that we use, distinctively marked by natural imperfection. 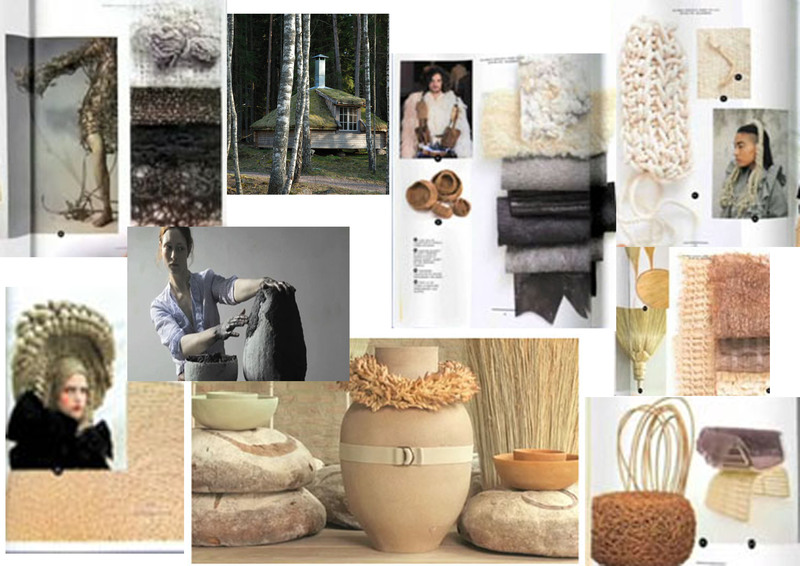 New natural, organic look, feel, characteristics, tactile properties and materials are going to remain in vogue throughout 2011. The four themes that fall under this trend are as follows. PRIMITIVE RAW theme talks about simple shapes, silhouettes’, patterns and manufacturing processes. NATURE’S HARVEST theme invites the use of untreated and unprocessed materials in making products to support the environmental aesthetic values. The theme FOLK TALES displays the hard work of the upcoming designers to relocate the forgotten expertise and craftsmanship to today’s modern world, hence providing a significant connection between the local and worldwide. The theme UNTAMED NATURE encourages us to use designs influenced and made by a revival of the craftsmanship from the olden times. Here are some pictures to depict the trend.